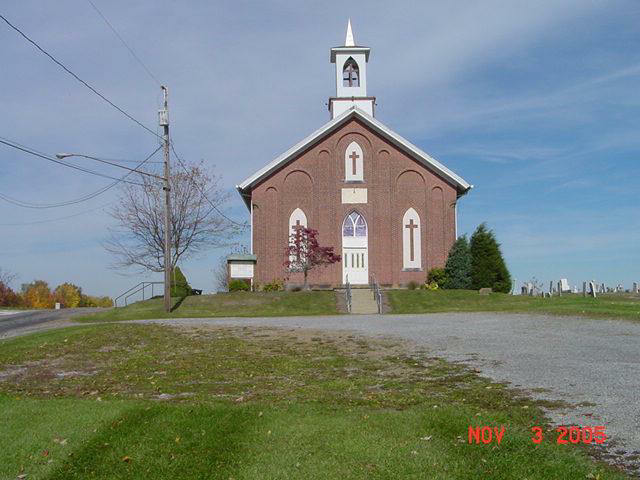 The following information is provided by the Carroll County Genealogical Society and can be found on pages 2-3 in their book "Carroll County Ohio Cemeteries, 1802-1990, Volume I"
The Augusta Cemetery is located at the Christian Church in Augusta on Andora Road (CR-10). The first Christian Church in the community was known as the Baker Church. It was a log structure built at Glade Run Corners in East Township in the early 1800's. There was a cemetery at the site. It is now referred to as Upper Glade Run Cemetery. Later services were held in the Manfull barn in Augusta. 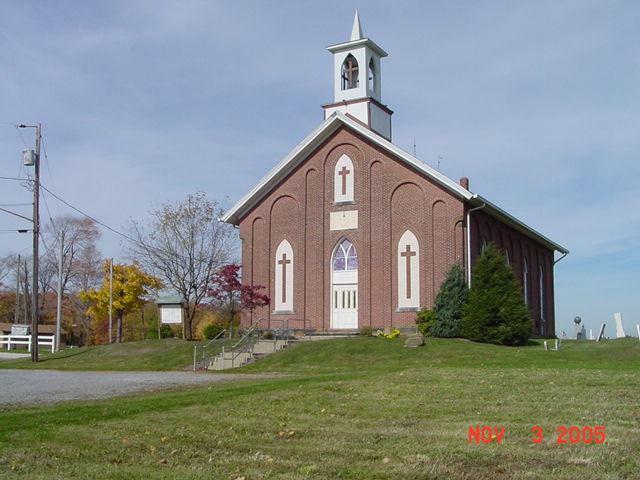 In 1842 a stone church was built on land donated by George Manfull and wife, Mary. The deed which was recorded June 10, 1844 identified it as part of the NW quarter of Section 15 in Township 15 of Range 5 beginning at the NW corner of the meeting house. It was given "for the purpose of encouraging the preaching of the Gospel and for a site of a meeting house or place of worship for the First Church of Disciples of Christ in Augusta and for no other use or purpose whatsoever." Church trustees to whom the land was deeded were William Elvin, Washington Iddings, George Manfull Sr. and William Manfull. In 1881 the church was rebuilt on the original foundation using brick for the building material. The bell from the old stone church was placed in the new house of worship and is still in use. In 1887 the church was incorporated under the formal title, "Christian Church of Augusta." The men who signed the incorporation papers were Sutton Cunningham, John L. Dowling, Jonathan Milbourn, Samuel Milbourn and Roland Pennock. The land surrounding the church was a part of the Manfull farm and has remained in the possession of George and Mary Manfull and their heirs. Lots were sold for burial purposes by family members until 1967 when the current land owner, Clair L. Manfull, closed the cemetery to future purchasers. On June 30, 1967, J. D. Crawford donated "5 acres more or less of land, which is part of the SW Quarter of Section 15, Township 15, Range 5, for the sole and only purpose of providing a cemetery or an addition to the Augusta/Manfull Cemetery." This land is directly across Andora Road (CR-10) from the old cemetery. For many years graves were cared for by family members. Ninety-seven year old Paul Manfull recalls "someone would say the cemetery needs mowing and we would all go up and mow it." This continued until February 21, 1925 when the Augusta/Manfull Cemetery Association was formed for the purpose of caring for the cemetery. Will Crawford was chairman of the first meeting and the motion to organize was made by Andrew Mills and seconded by Eli Manfull. It was decided to elect 2 trustees from the Augusta Christian Church and 2 from the Stillfork Presbyterian Church. The 4 elected trustees were then to appoint another one. Will Crawford, Dan Manfull, George Manfull and Ralph Sheckler were elected trustees. Lot owners were asked for donations and an endowment fund was set up to be used to care for the cemetery. 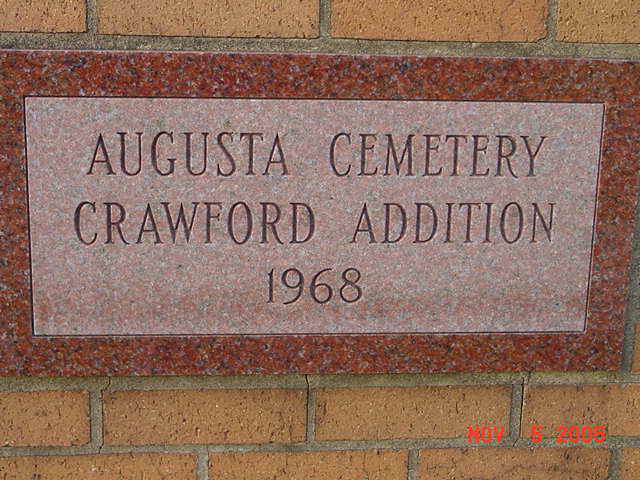 The name of the association was changed to the Augusta Cemetery Association September 8, 1972 when the accounts of the Augusta/Manfull Association were combined with those from the Crawford Cemetery Addition.